PMT Service is a family owned and operated business. Being a family operated business allows us the ability to respond to our customer sales and service needs personally, and efficiently. Our Goal is to give every customer the quality service they expect and deserve with the least amount of possible down-time. With over 50+ Years combined FIELD EXPERIENCE, UNMATCHED QUALITY SERVICE 24/7, FREE PHONE SUPPORT 24/7, and TRUCKS STOCKED WITH PARTS we are able to achieve our Goal. Our Service Technicians hold and maintain certifications for Every Major Turf and Municipal Water Pumping System Manufacturer. Including VFD Certifications for installation, start up, and warranty inspection/troubleshooting. Controls, Cla-Valves and Filtration are also a major part of our expertise. BWI Companies, Inc. was founded in 1958 by Bob and Betty Bunch as a retail seed store in Texarkana, Texas. The company began wholesale operations in 1972 and has since expanded to a total of 18 locations, including 8 full line distribution centers across the Mid-south and Southeastern United States. Details and RSVP Coming Soon! and MUST be dressed in A&M attire. No large cameras. Passes will be available for pickup on game day outside stadium. Aaron Clary fired a 1 over par 73 to capture the 2018 Central Texas GCSA Chapter Championship. Our affiliate Champion for the day was Dale Miller who battled the heat and carded a 2 over par 74. Overall we had a great Day at FalconHead GC! Thank you to Ameriturf for sponsoring this event and thank you to our host Halsey Hammond for getting the course in such fantastic shape for our event. Click logo to learn more about their products and services. Falconhead Golf Club opened in 2003, an incredible addition to Austin golf. Laid out by the experts from the PGA Tour Design Center, our public daily-fee course offers golfers a taste of the quality golf that pro players contend on in one of the most beautiful areas of Texas, the rolling terrain of the Central Texas Hill Country in and around Austin. The vision of our architects was to fit Falconhead lovingly into the gentle ups and downs of its site West of Austin. They kept all the flavor of this unique land shaded by gnarled trees and crisscrossed by meandering streams and creeks. The Tour’s seal of approval means that we offer you the kind of excitement you would expect to find at a tournament-level course, combined with a chance to succeed no matter what your skill level. We have five sets of tee boxes to provide you with exactly the kind of round you want to play. A great day at old Brack! honoring CTGCSA Pioneer Ted McClure. Superintendent Robert Cano and his staff. Brackenridge Park Golf Course was in great shape and it was great to play at such an historic venue. Congratulations to Bruce Burger’s Bushwood Boys on Defending your title! Austin Turf and Tractor was a great sponsor and cooked up some mean burgers and dogs for the event! Brackenridge Park Golf Course is the heart of the Alamo City Golf Trail. 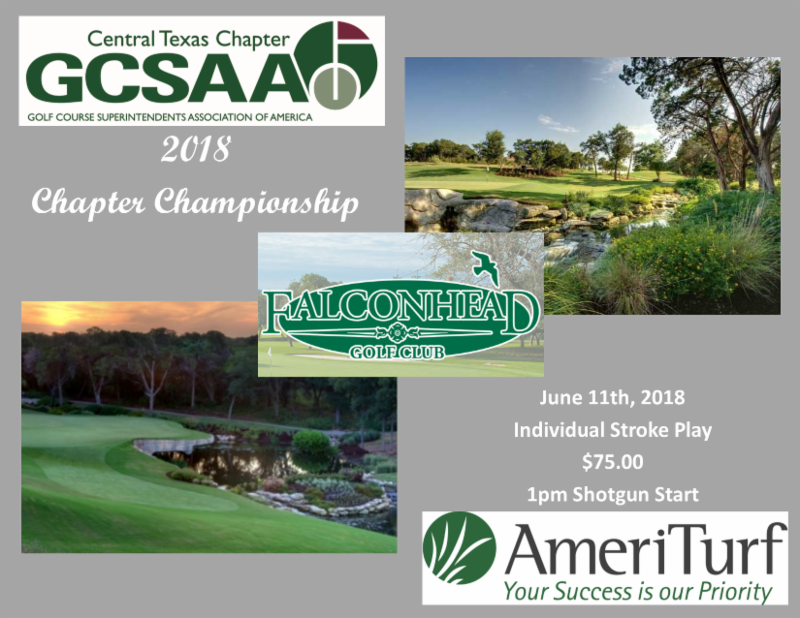 Located just north of downtown San Antonio, this course is accessible for locals and visitors alike. The 2008 restoration of “Old Brack” re-routed the course to A.W. Tillinghast’s (1916) original layout and renewed its conditions to compete with San Antonio’s premier golf courses. Anyone playing golf in San Antonio should tee it up at Brackenridge to enjoy its wonderful history and fun city-park layout. Brackenridge Park Golf Course is also the new site of the Texas Golf Hall of Fame. Come visit the clubhouse to see the “Walk of Fame”, the “Wall of Frames”, and the Texas Tournament Trophy Room! Did You Know…..Brackenridge Park Golf Course is the original home of The First Texas Open! The Valero Texas Open is the 6th oldest professional tournament in golf world-wide, the 3rd oldest on the PGA Tour. From the event’s inception until 1940 it was played at Brackenridge Park Golf Course. Even after 1940 it was still played sporadically until 1959. Come play history at Brackenridge and relive the victories of Byron Nelson (1940), Sam Snead (1950), Jack Burke, Jr. (1952), and Mike Souchak (1955). CLICK HERE FOR PHOTOS FROM OUR GREAT DAY AT OCCC! 2018 Turf Show and Legacy Scholarship Fundraiser. Our host this year is Ryan Crump. Thank you Ryan for being our host! great members who purchased the auction items. Way to go CTGCSA Members!